Ever since Grizzly was founded way back in 1983, the company has grown into one of the biggest machinery companies in the country and nowadays you can easily find its products in any home improvement store. Not only does Grizzly have a wide range of products you can select from, but if you’re currently looking for a new wood lathe and are yet to find one that suits your needs, then you may want to check the Grizzly G0624 out, since it’s amongst the top lathes the company has to offer. 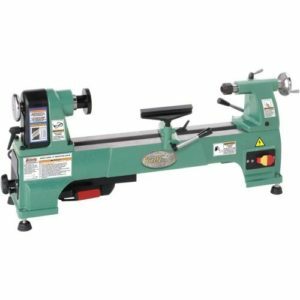 This is a high performance best wood lathe for beginners that has a powerful motor and comes with plenty of accessories to ensure that you get a “full package” without the need of buying anything else to get the job done. On how to choose the best wood lathe, here’s a good article. 120V, 1/2 HP single phase motor. Seven and a half inch swing over tool rest. Motor speed ranges between 480 and 4000 RPMs. Comes with a three-inch face plate, spur center, live rolling center and tool rest. Turning bowls and plates is now easier than ever thanks to the fact that the Grizzly features a heavy duty cast iron finish. Coupled with the ten-inch spindle, you can increase your work efficiency by a large margin and thus finish work on your designs and pieces much faster. Some people though will need the functionality of a full sized lathe and if that’s also the case for you, then you can easily convert the G0624 into one by using an optional bed extension. By doing so, you’ll be able to easily work with larger workpieces when resurfacing or designing any surface. The powerful 1/2 HP motor of the G0624 is more than you need to work on the roughest surfaces and given the fact that there is a total of 6 spindle speeds to choose from, you have enough flexibility to complete any project professionally and on time regardless of the toughness of the wood, you may be using. For even more accuracy, you can use the spindle speed and change the speed from 480 RPMs to 1270 RPMs, 1960 RPMs, 2730 RPMs, 3327 RPMs and maximum 4000 RPMs. This is a nice option to consider since it lowers the risk of damaging your workpiece if you’re using a higher RPM setting, whereas the material requires a lower setting for safety concerns. You’re not going to work on small projects all the time and that is why Grizzly fitted the G0624 with a three-inch faceplate which extends your ability to work with larger workpieces. On top of that, this bad boy weighs a little under one hundred pounds, so if you need to take it from one worksite to another it won’t be a problem at all. It has yet again delivered more than anyone has expected, releasing a lathe that is powerful, very flexible and also able to work with many types of wood for accurate and professional looking results every single time.